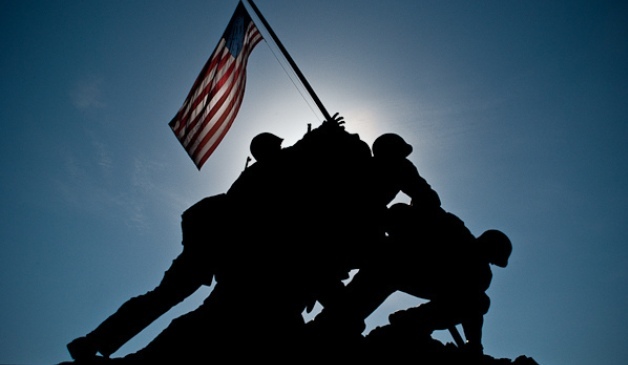 67 years ago today, it didn’t seem much impeded the Marines from raising a U.S. flag atop Mt. Suribachi except the wind. No Japanese are seen, and nearby Marines watched the Stars & Stripes go up without cover on the highest point of Iwo Jima. It could be interpreted as the final act of the battle. The iconic photograph taken by Joe Rosenthal is the reason we remember the battle. It’s possibly the most reproduced photo of all time, and the moment will live forever in bronze as the Marine Corps War Memorial in Arlington, Virginia. But the flag went up on the fifth day, and it didn’t end until March 26. By then, 6,821 American troops were dead, and nearly 20,000 wounded. Almost a third of all Marine Corps casualties in World War II were killed on the volcanic sands of bloody Iwo. The image we all carry should remind us all of the tremendous sacrifice of the Marines and Navy Corpsmen in that battle, and not just the single moment of triumph captured. That reminder is especially poignant today, as Americans awoke to news of seven Marines killed in a helicopter crash during a training exercise in Arizona. Even at home, the military can be a dangerous business to undertake. For a brief moment on Mt. Suribachi in February 1945, Marines enjoyed a respite from the brutal fighting that had gone on for nearly a week. After the photo seen ‘round the world was taken, the eleven men who raised the famous flag and another one got back into the war. Only five left the island alive. That’s something no photo could ever capture. Alex: THANK YOU for your remembrance of those who served in the Pacific Theater. All three Uncles in my family served in the Pacific – two Marines and one Army Air Corps pilot. We just buried our last WWII Vet two weeks ago. Your remembrance of those who served in the Pacific, along with tying their sacrifices to all those who serve today, is REALLY appreciated. Thank you! Alex, I guess you were absent when yr schoolmates were learning bout WW2. There no 11 Marines raising the flag, it only 5 Marines and 1 navy Corpsman. 3 of the 6 were killed later in the fighting 4 said isle. 2 Marines and the Corpsman were returned to the States 4 a war bond drive, they raised 26 million $$$. I guess, also, that you didn’t read the description of the youtube vid you posted with this article. I’m a Marine Veteran(’69-’75), I learned of this historical event in elementary school in 1958. It was refreshed by Marines DI’s in Marine boot camp. I suggest next time read and study the subject you are writing about, then there would be no fuckups like this. This event will never be forgotten. Especially by the families which have been impacted so thoroughly. Ira Hayes will never be forgotten by his family and relatives. We carry on his humble honor in our hearts and pass it down to the generations. Rest in peace, Ira. You and your friends will never be forgotten. Pima’s will always remember. I’m really glad that this article was posted. I think that nowdays, young people my age don’t really care about the past or what our veterans lived and died for. I woudln’t have the freedom I have today if those men on Iwo Jima and other battles hadn’t sacrifically given their lives and youth to make sure our nation and world stayed free. We are forever grateful to them. I think of kids today who are only concerned with the present. There is so much history of our military and all the details that are so important to teach kids in school today. I don’t know of anything better than films that depict the second world war. I know how I loved history in High School. I imagined all sorts of things that went on, and the horror of injury and death. We fought two fronts of horrible people who really wanted our country for themselves. If either had won, we would be the slaves of that empire. Only about 10% of all classmates every year are qualified to know all about our country. There is little in our education system, and especially in California where I live to teach a trade. When I was in high school in Oklahoma, I took a wood class for three years. I made a cedar chest by hand . No power tools. It took me the whole year to do it, but it still exists today much as it was the day I finished it, and also the A I got in that class every year. My father who was in the 2nd world war was not the same man I knew when he came home from the war. He flew b-17’s over Germany. A terrible dangerous job. My mom warned me not to try to wake him while he was asleep. He had bad dreams for about a year after he came back, and he was one of the lucky ones that wasn’t injured physically. However, mentally he suffered, with out treatment. Those days were in 1945 and on. We should all take the responsibility to help a veteran who comes back from any war., anytime. I hope that if you’re reading this, you will take some time out to inquire about veterans in your area. Find out if you can help even in a small way at Veterans hospitals . Especially help veterans trying to find a job. Nothing helps better than that.